EcoDomo is a market leader for sustainable creative applications of leather from floor to ceiling. Thanks to the innovative product design and exceptional performance of our leathers, the application possibilities are endless. 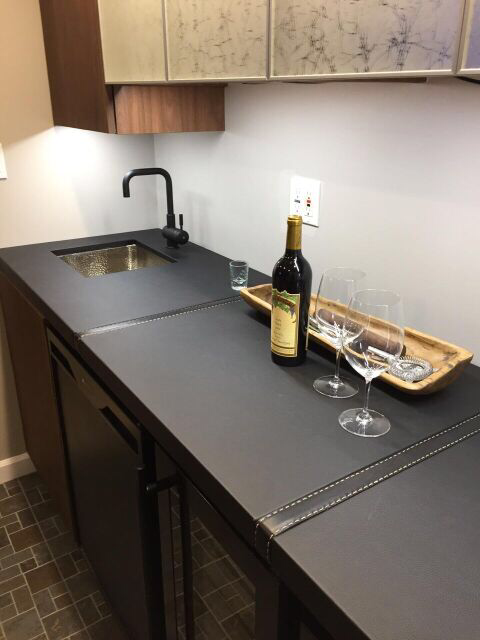 Within the countertop segment alone, EcoDomo products are designed for both residential and commercial usage. Our products are always readily available and made in the USA, and can be found in closets, libraries, furniture systems and more. Closet island tops, hutches, benches, coffee tables, reception counters and eat-in areas in kitchens. The leather countertops should be maintained with a humidified terry cloth to wipe clean. Surface scratches may be treated with EcoDomo leather fill sticks, shoe polish or matching leather markers available from furniture stores.